Maximize storage in your bedroom with this Media Dresser. The dresser has a rustic, cottage design featuring a planked top in the natural weathered finish the rest of the dresser is done in antiqued white finish. The dresser features a variety of storage options including two doors opening up to shelving, four drawers including cedar lining in the bottom two, a felt lined jewelry tray and a drop front drawer for media use. The Cottage Multi-Drawer Media Dresser by Cresent Fine Furniture at AHFA in the area. Product availability may vary. Contact us for the most current availability on this product. Drawer / Shelf Construction English Dovetail drawer construction with dustproof panels framed in solid wood. In addition to hand-sanding and lacquering all our drawer interior to provide you with snag-proof storage, Cresent uses Aromatic Cedar Drawer bottoms in many cases for further protection from insects and musty smells. For further protection for delicate items, the top drawers of Cresent dressers include felt liners. 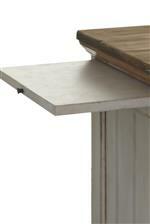 Drawer Suspension We use the highest quality European under mount self-closing drawer guides. 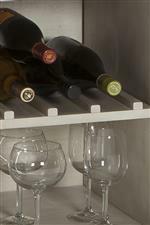 These provide an effortless drawer pull, combined with a convenient self-closing feature. Case Construction To reinforce the stability of our cases, we use corner blocks and other bracing features on the interior of cases. Style your home with the casual yet sophisticated design of the Cottage Collection. A variety of beautiful pieces for your living room and dining room. 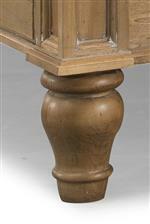 Each piece stands out with a two toned finished including a weathered natural finish along the top and antique white finish for the base. Plank tops and natural characteristics give the collection a relaxed and rustic feel. The Cottage collection is a great option if you are looking for Relaxed Vintage Cottage furniture in the area. Browse other items in the Cottage collection from AHFA in the area.